After years of taking lessons at several different barns I found the right fit with Jonna and her barn. I rode her schoolmaster Frenchy, and was very impressed by his temperament, patience, and amount of training. The barn is small, safe, and unpretentious, and I enjoy spending time with all the horses, their owners, and other riders. We soon realized that I was ready for my own horse and Jonna helped me with all the details. Together we found Patrick, and in the past year we have made tremendous progress with his training. I feel very lucky to have an educated trainer with me every step of the way. 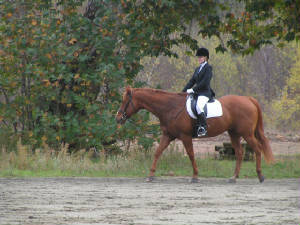 I have been riding for 11 years and after selling my horse when I went to college, I wanted to further my dressage training. I found Jonna and went to have a lesson from her. I rode her horse Frenchy and was impressed by how technical she was with what she wanted me to do. If she wanted me to change something with my position we would discuss the different approach and its advantages. If I wasn't able to understand something she would demonstrate it on the horse for me. Since taking lessons I have improved my lateral movements by understanding exactly how each part of my body make a different part of the horse move. Jonna's horse Frenchy that I ride is a true school master. He is very well trained but yet will challenge you, making sure that you ask for each movement correct. I have never ridden a horse before that has such a kind heart, he will give all he has to you. I look forward to every lesson that I have. I purchased Alamoso a few years ago and had moments where I thought that it was a mistake. Jonna has been extremely helpful and patient, her ability to take a problem, break it down and examine each piece has been the perfect approach for both myself and my horse. It is a rare quality to find an educated trainer without a personal competitive agenda. Myself and others who know my horse are amazed at the progress we are making. I am looking forward to what we can achieve in the future with Jonna's guidance. If you are here at the First Light Dressage webpage, you just might be someone similar to me. I was bit by the horse bug early and fortunate enough to have had a horse or two as an adolescent, but taught “myself” to ride by watching others. And when grown-up responsibilities intervened, I pursued them. Before I knew it, twenty-five years of my life had passed without horses. 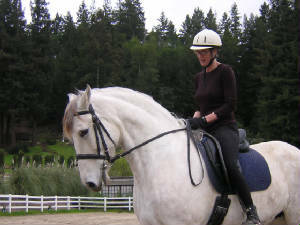 That changed when a long-time friend decided I ought to get back into horses and found me First Light Dressage on Bay Area Equestrian Network. 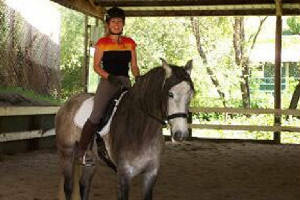 Now, I have been taking weekly lessons with Jonna Lorenz at First Light Dressage for nearly five years. Today, we laugh about my first day at the barn when I and trotted off on the giant dressage schoolmaster that was available for lease. Jonna wasted no time in sizing up skills and found me a more suitable, and less forward partner, and then another, and “another” as my technical riding skills developed under her tutelage. Today, I have a great relationship with a challenging Warmblood, Nordi, that I adore, and spend my riding time practicing leg-yield, collected canter, haunches-in, and trot half-pass. 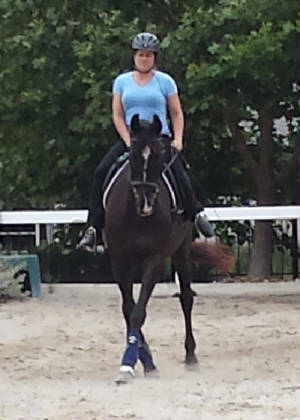 I enjoy training with Jonna because she not only loves and is very knowledgeable of classical dressage, but competes, and demonstrates a great ability to communicate her knowledge to her students. Jonna varies her teaching methods to ensure the message she wants to convey is understood. She is not condescending and does not coddle students. Jonna encourages her students to progress with their training and practice to achieve their own personal riding goals, which may or may not be competitive. First Light Dressage has an eclectic compilation of students: horse-loving teenagers, adults getting back into riding after decades off, persons that love dressage but do not compete, and competitive three-day eventers. I highly recommend Jonna as a riding instructor without hesitation. 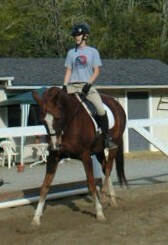 After retiring my first horse, I wanted to find a horse to continue my training at the upper levels. Jonna helped me find my next horse Rainbow. Rainbow had been showing successfully at 3rd level. He listens to every subtle movement of my position and Jonna’s knowledge of rider biomechanics has been essential in creating brilliance in his lateral movements. Jonna and I are improving the quality of his collection, even introducing him to Piaffe and Passage…He loves it! Ever since I was little I wanted to ride horses but it seemed like no barn would work for me, until I found Jonna and her barn. 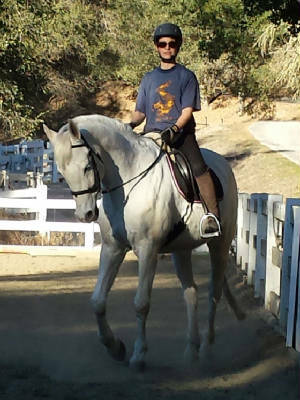 I came in as a beginner, as in I didn’t even know what dressage was, but as the years have progressed, so have I. I now have my own horse, a 20 year old Quarter Horse named Julius who is showing 1st level and advancing everyday. Together Jonna I have trained this formally western boy into a very lovable and showable dressage horse. This barn fit right into my daily life, as a second home and the other riders are like family. 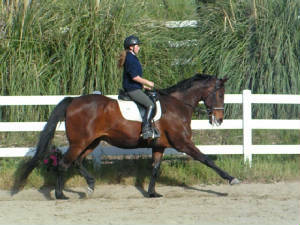 Jonna is an amazing instructor and poor Julius and I would be lost without her. step of the way and we found a fabulous match for me. have made extreme progress in a very short time. progress with their own skills.